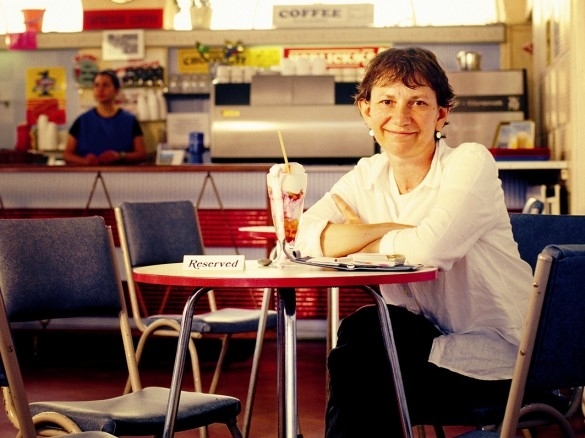 Rendezvous is a compilation of five short plays to celebrate the life and work of former Live Theatre writer in residence, Julia Darling, who passed away in 2005. Each one is a nugget of gold which reflects the esteem and love that those who worked with Julia still feel about her. Jack (Zoe Lambert) is looking for the light from across the sea that she has always been able to see since she lost Sam. The only difference is that today is Jack’s wedding day. 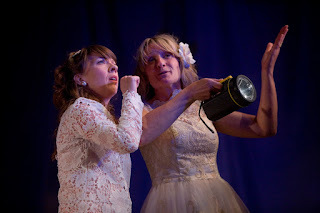 When the bride Charlie (Karen Traynor) appears to find out what’s happening it reveals the complicated nature of relationships and the need for trust. The most damning evidence can sometimes be explained by straightforward explanations. The result is an enchanting look into how fragile (or strong) relationships can be. 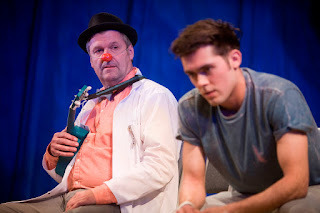 A children’s ward can be a very tough place and Clown Doctor Charlie Dander (Phil Corbitt) finds himself with one of the older patients Aaron (Dean Bone). The 17 year old is in for a heart transplant and has chosen to stay in that ward but he is far too cool to be seen talking to a clown. Phil is fantastic as the professional who gives the patient a chance to be heard. A number of funny lines and visuals punctuate a tricky situation. Dean plays the young lad well as the reluctant convalescent. It is a powerful piece that goes to show that you don’t know what you’ve got until its tested. A pair of teens are working through a story, except he hasn’t made it his priority to actually read it past the first section of the book. 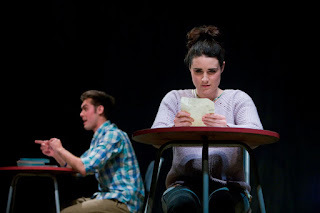 Lauren Kellegher’s character tries to get the lad (Dean Bone) to do as she wishes, in turn mirroring the story they’re studying. The pair try to work out the basis of the love story and the terms by which relationships can be defined. The use of the love letters is a humorous device to reflect the frustrations that the pair are suffering from. Another clever twist, and a knickerbocker glory for two, keeps the story delightful. 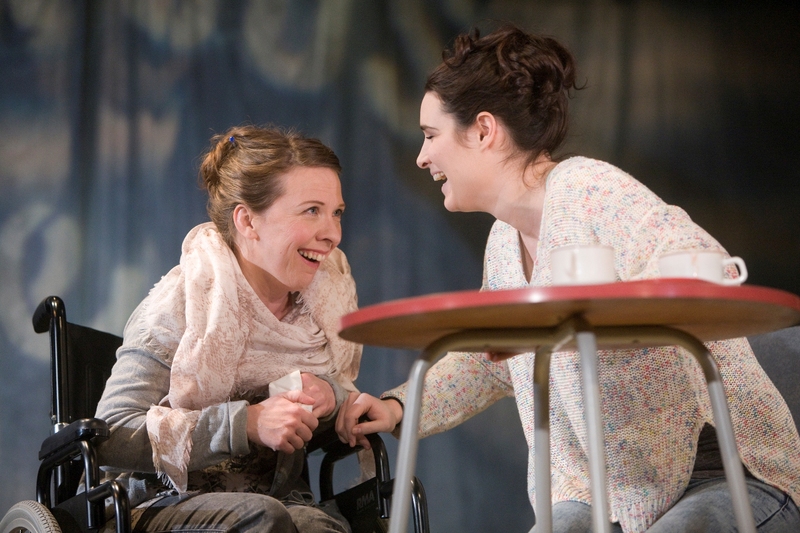 The special bond between a mother (Karen Traynor) and her daughter (Lauren Kellegher) is put to the test after a visit to a doctor (Zoe Lambert) brings bad news. Some creative swimming and sweet Horlicks help create a tough but realistic plight. The frustration isn’t over played. A moment when they are struggling to navigate around a café is both an eye opener and light hearted. The spirit and bravery is punctuated by humour resulting in a thought provoking tale – when does realism lead to pessimism? Gateshead resident Jo Milne hit the headlines last year when she was able to hear for the first time, after nearly 40 years, following cochlear implant surgery. The final story of Rendezvous is a remarkable verbatim play between Jo (Zoe Lambert) and Tremayne (Phil Corbitt) who have known each other a long time. Tremayne is a major fan of music and has been tasked with putting together a mix tape to bring Jo up to speed with what she has been missing. 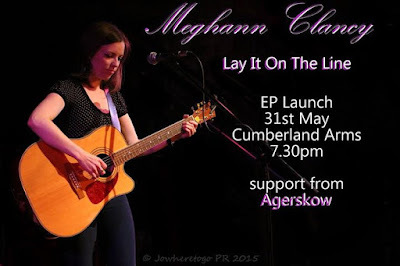 The dialogue highlights how lip reading can pick up on regional accents or how Jo had to learn environmental sounds, like church bells, for the first time. They also expose how uncomfortable people can be around disability, which does not make for comfortable listening. Rendezvous is a smart collection of short plays that have a hard message wrapped in a humorous exterior. 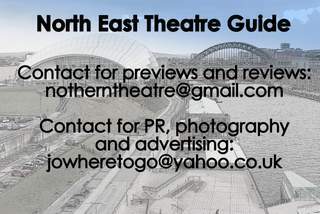 They all carry the hallmarks of the high end quality new writing for which Newcastle’s Live Theatre is recognised for. The end result is a pleasing, inspiring and enthralling evening’s entertainment. Julia Darling would be proud. Tickets for Rendezvous cost £14 to £10 full price, £12 to £10 for over 60s and other concessions are £5. 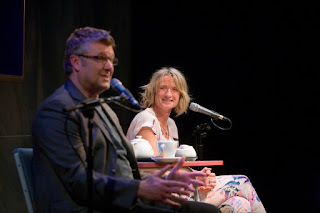 To find out more about the production and the special events to coincide with the plays visit www.live.org.uk or call the box office on (0191) 232 1232. 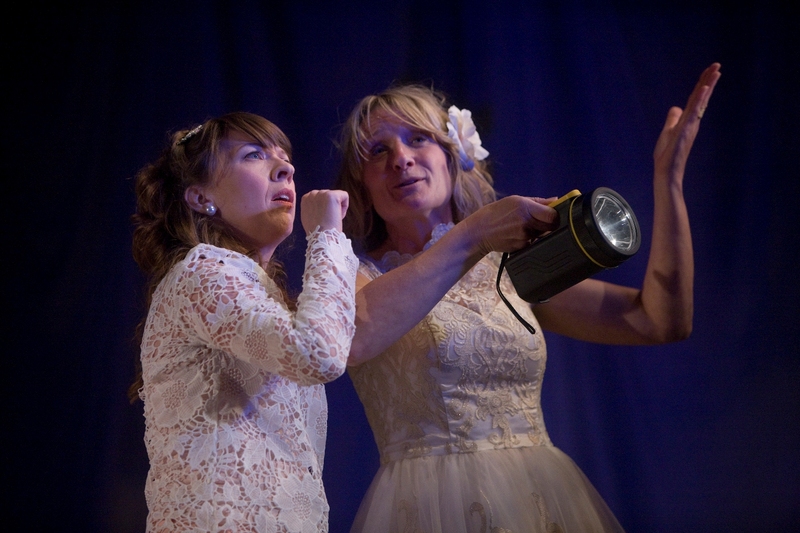 Live Theatre is delighted to host an evening celebrating Julia Darling’s writing. This cabaret style evening will feature poetry, fiction, extracts from plays and live music performed by many of Julia’s long time collaborators, performers and friends including The Poetry Virgins. New Writing North will also be announcing the winner of the inaugural Julia Darling Travel Fellowship, a new award to support a writer to travel and write, that has been created in Julia’s memory at the event. The original First Aid Kit for the Mind, developed and made by Julia Darling, Emma Holliday and Jay Smart, was the start of a collection, a piece of ‘home’ in a box should you find yourself in a hospital or other setting where you would need something familiar. For ten years the boxes have retained their original contents however this workshop will be branching out from this format and letting it take the next step of its journey. Join writer Emma Holliday and writer Anna Woodford in this workshop which features art and creative writing activities designed to help you create your own box or one for someone else. Places are strictly limited so please book early. The Poetry Virgins used to gather round Julia’s kitchen table with bottles of wine and nibbles, bouncing around ideas for poemsand performances and laughing. They wrote about cars, bras, birth and politics and much more. This is your chance to join The Poetry Virgins, including Charlie Hardwick, Kay Hepplewhite, Fiona MacPherson and Ellen Phethean, as they revive the bonhomie and creativity for one more night. An informal conversation with some of Julia’s colleagues and collaborators remembering and re-evaluating her work, her legacy and influence across the full range of her creative canon – plays for theatre and radio, poems, short stories and novels. Why a gay writing workshop? 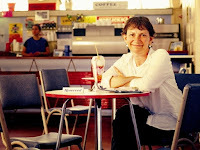 Creative writing workshops for the lesbian, gay, bisexual and transgender (LGBT) communities were a major part of the proudWords festival, giving LGBT people, both writers and non-writers, the opportunity to express themselves in a supportive, queer-friendly environment. Lisa Matthews will lead this workshop with a range of writing activities about how we can celebrate the unique literary contribution the LGBT community makes. Using Julia’s own 2005 poetry workshop for the Guardian, explore ideas by writing about what you don’t know. Cold Calling is a screen adaptation of Julia Darling’s theatre play Attachments about a recently bereaved anaesthetist who gets an unexpected call from a pushy but not entirely successful door-to-door Hoover salesman. Filmed in front of a live audience and first broadcast by Tyne Tees in 2003. To say that Julia Darling was a founder member of Operating Theatre is not quite enough. In fact, it could more truthfully be said that she was the very reason for its existence. It was Julia Darling’s play Eating the Elephant about cancer that convinced Dr Dominic Slowie, then a lecturer at Newcastle University’s Medical School, that drama could be a valuable tool in medical education. 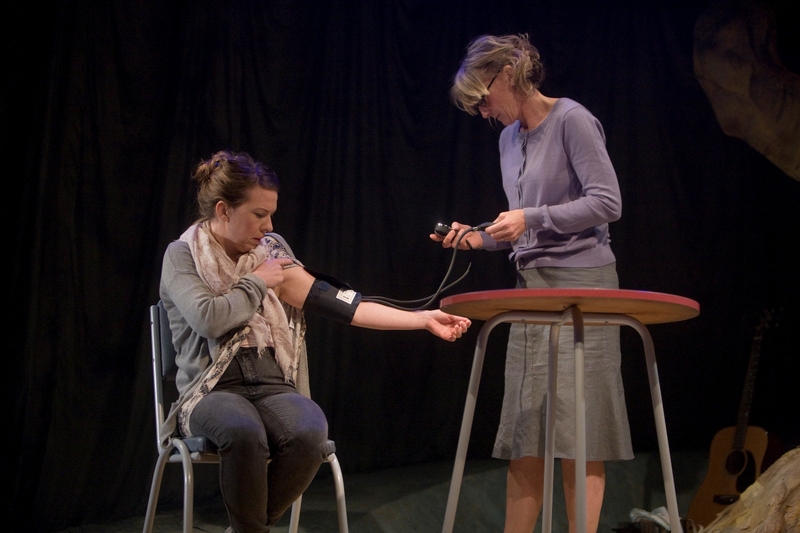 Fourteen years later Letters Home is one of the four plays performed each year by Operating Theatre for Newcastle Universitymedical students. Julia Darling and Ellen Phethean at Diamond Twig Press passionately believed in encouraging new women writers. With her work and expansive personality, Julia inspired and encouraged writers wherever she went. Ellen and Diamond Twig host a reading by women and men, poets, new writers, experienced published writers - each of whom have contributed a poem to Julia’s memory and written a few words about how she inspired them.